I came across the Marble Run idea on Pinterest several months ago and started saving all my cardboard tubes. We didn't get around doing this activity until recently. 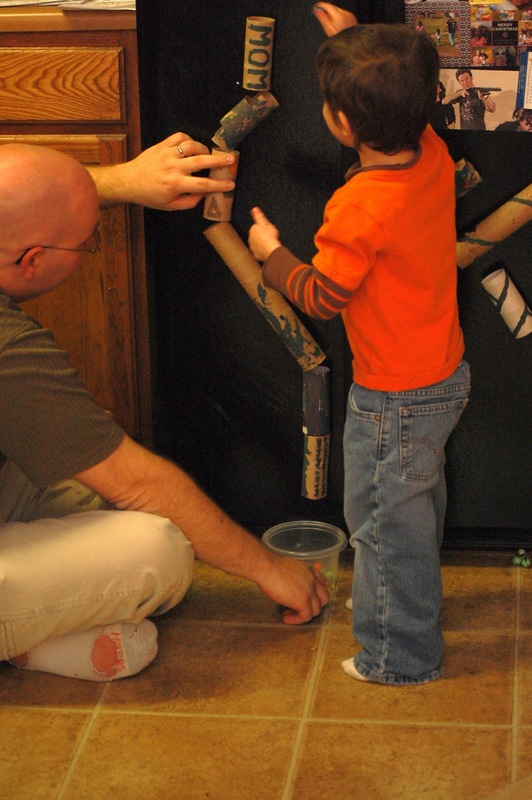 Not only did The Toddler LOVE this activity, but so did the spouse and I! 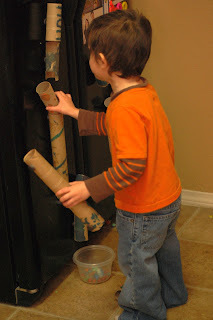 It's problem solving game to see just how you can get your marble to run all the way through the tubes without falling out. We used acrylic paint (because that's all we have) and allowed The Toddler (equipped with a bib) to paint the tubes. And we painted them too. Because it was fun. Be aware that if you give your child more than one color at a time, they may end up dipping their brush in EACH color before they actually begin painting. And all those pretty colors may end up looking more like a greyish-olive green. After the paint was dry, I hot-glued the magnets onto the tubes. Ahhh!!! Rolling marbles through this is so much fun, I can hardly stand it!! And when you are done with your tubes, you can also do this. What more could a kid ask for? that is such a fab idea!!! Oh my goodness I LOVE this idea! 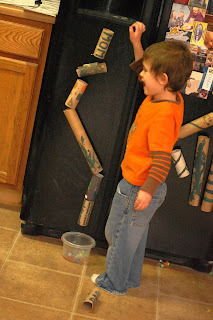 The magnets on the tubes are genius! It certainly looks like lots of fun! I have been wanting to do this too. It looks like so much fun! Thanks for reminding me and sharing how much you all loved it. this is BRILLIANT! I am sharing with everyone!!! What a clever, way fun idea!! Love it! I am your newest follower. I'd love for you to follow me back, if you wan to =-) I also wanted to invite you to link up at my kid oriented linky party TGIF - http://livinglifeintentionally.blogspot.com/search/label/Linkey%20Parties - I know my readers would love this too! This is great! We're going to have to try it out! This is awesome!! Can't wait to do this!!! I LOVED this so much I featured at TGIF this week - http://livinglifeintentionally.blogspot.com/2012/01/tgif-linky-party-14.html - thanks for linking up!!! 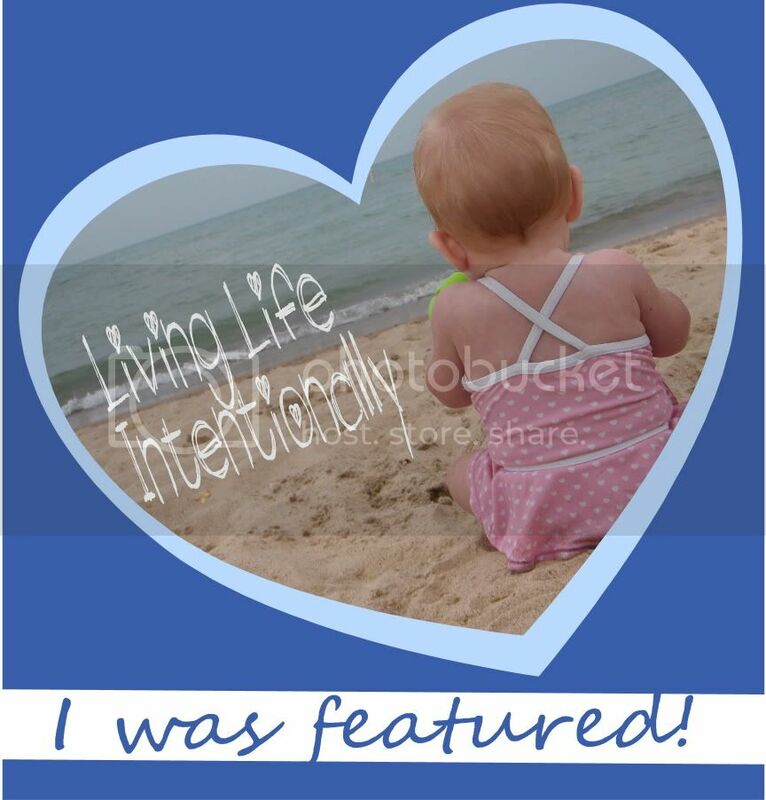 Come grab an I was featured button & link up again this week! Love it!! I never thought about putting magnets on the back - what a clever idea!! I posted a link to this on my blog...thru my pinterest board! Ooh totally going to do this with my kids!